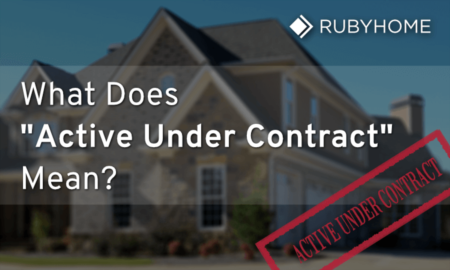 Active Under Contract The status of real property (single family home, condo, townhome, etc.) that has been put up for sale wherein a seller has accepted an offer from a buyer, but the deal has not yet closed. Adjustable-Rate Mortgage (ARM) A mortgage where the interest rate periodically adjusts. The rate and is tied to an underlying market index such as the London Interbank Offered Rate (LIBOR). Amortization The schedule of loan repayments over a specified period. Annual Percentage Rate (APR) All of the interest and fees paid, over the life of the loan, expressed as a percentage. Appraisal An estimate of the value of a home. 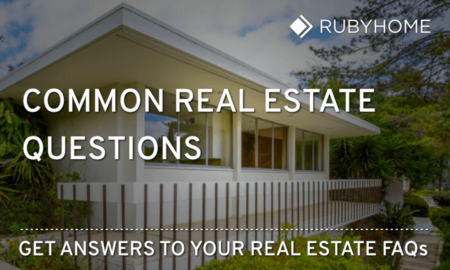 Most often, the value is determined by comparing it to recent sales of nearby, comparable properties (comps). Assumption When a buyer accepts a seller's repayment responsibility for an existing mortgage (lien). Balloon Mortgage A short-term mortgage that is amortized over a long period of time. The remaining balance is due at maturity. Bi-Weekly Mortgage A mortgage with a payment schedule every 2 weeks (26 half payments annually) or 13 full payments each year. The extra payment(s) apply to the principal balance, thus the loan is paid off faster. Bridge Loan A short-term loan, taken out against a borrower's current property, used finance the down payment on a new property. Eases the transition of ownership between two properties. Buy Down A fee, or point(s), paid to a lender in order to lower the interest rate on a mortgage for a short period of time. Buyer's Agent A licensed real estate agent who represents the buyer in a home-buying transaction. Buyer’s agents negotiate on their client’s behalf with no divided loyalties conflicts of interest. Buyer's Market Periods when real estate markets favor buyers. Prices are driven lower and/or homes sell slower because supply exceeds demand. Caps The maximum interest rate that may be applied to an adjustable-rate mortgage (ARM) at any given time. There are three types of caps. The Initial Cap sets the maximum interest rate at the first adjustment. A Periodic Cap sets the maximum interest rate increase from on adjustment period to the next. The Lifetime Cap sets the overall maximum interest rate. Closing The final step of the home buying process that includes things like signing loan documents, disbursing funds and recording the deed. Closing Costs Fees, collected at closing, that cover the costs of a real estate transaction. Each services provider is paid for their work such as lenders, title companies, appraisers, and real estate agents. Closing Disclosure A form that itemizes the final (as opposed to previously estimated) costs of a mortgage transaction. Required, by law, to be delivered to the borrower 3 days prior to closing. Compensating Factor Positive aspects of a borrower or property that help offset negative items. Underwriters may approve an otherwise an otherwise borderline loan application when compensating factors are present. For example, a borrower with low credit score may still get a home loan if they bring a bigger down payment (say, more than 10%) to the table. Energy efficient dwellings may also be a compensating factor because the expected monthly energy costs will be lower (thus putting more money in the borrower’s pocket to afford their mortgage payment). Conforming Loan A mortgage that does not exceed loan limits set by government-sponsored agencies (GSEs) Freddie Mac and Fannie Mae. Conforming Loan Limit The maximum loan amount for a mortgage that meets Fannie Mae or Freddie Mac guidelines. Contingencies Clauses that define what conditions must be met before a real estate contract is binding. Seller repairs, final loan approval for buyers, or an adequate appraised value of the home are common contingencies. Conventional Mortgage A mortgage not insured by a government agency such as FHA, VA or USDA. Credit Report A document that details the history of a borrower's loan payments, missed payments and outstanding debt balances. Includes a credit score, which is a summation of all financial activity, rolled up into a single numerical expression. Credit Score The summary of a borrower's financial profile and credit history, expressed as a number on a scale of 300 to 850. Debt-to-Income (DTI) Ratio Compares a borrower’s gross monthly income to all monthly liabilities (mortgage payment and other debt obligations). Expressed as a percentage (e.g. 40%). Sometimes called a “back-end” ratio. Deed-in-Lieu of Foreclosure A borrower conveys all interest in a real property to a lender to satisfy outstanding debt (the mortgage) of a loan currently in default. It is an instrument used to avoid foreclosure. Default When a borrower fails to make mortgage payments on time or in full. Delinquency When a borrower fails to make a mortgage payment on time. Discount Points A fee, paid by the borrower to the lender, that covers prepaid interest on a mortgage, resulting in a lower lifetime interest rate of the mortgage. Down Payment The initial payment by the borrower, applied to the purchase of a home. The difference between the down payment and the sales price is the mortgage amount. Earnest Money A borrower's deposit, paid to the seller, as a commitment to buy a home. Earnest money is held by a third-party (escrow) until the transaction is closed at which time the funds are applied to the closing costs. Escrow A third-party account that holds funds until the transaction between parties is completed. Typical escrow deposits, for a real estate transactions, include the down payment, taxes and insurance. Fannie Mae HomePath Loan An expired loan program developed to clear foreclosed homes from the market after the 2008 mortgage crisis. FHA Loan A mortgage issued by a lender that is insured by the Federal Housing Administration (FHA), a division of HUD. Final Walk Through The buyer's final visit to the property before closing to verify that the home is in its expected condition. Often, the reason for the visit is to see if the sellers made required repairs (satisfied the contractual contingencies) and removed all personal items like furniture. Fixed-Rate Mortgage (FRM) A mortgage where the interest rate remains the same for the life of loan. First Time Home Buyer A person who's never owned a home, or has not owned a home at any point in the last three years. Good Faith Estimate (GFE) A form that itemizes the costs of getting a home loan. Still used for reverse mortgages, but replaced for most loan programs by the Loan Estimate (LE) in 2015. Hazard Insurance A policy that protects borrowers from losses incurred by theft and damage from fire, earthquakes, hail and other natural events. Home Equity The value of a property after subtracting liens (outstanding debt). A home worth $400,000, where $300,000 is still owed, has $100,000 of home equity. Home Equity Line of Credit (HELOC) Also known as a Home Equity Line, is a line of credit extended by a bank, using the house as collateral. The amount of credit is fixed as well as the time period. During the loan period, equity may be withdrawn (as cash) by the borrower. Homeowner's Insurance A liability policy that protects homeowners in case someone is injured on their property. It covers medical bills if someone is injured and/or sues the homeowner. Housing Expense Ratio Compares a borrower’s gross monthly income to the monthly mortgage payment. Sometimes called a “front-end” ratio. H.U.D. The United States Department of Housing and Urban Development (HUD) is a government agency that oversees mortgage lending. Impounds Money collected each month from the borrower, and set aside (held) by the lender to pay for upcoming property taxes and insurance. Index An economic market indicator (such as the LIBOR) used as the basis for the interest rate charged on an adjustable-rate mortgage (ARM). An index changes with market conditions. Inspection Determines the soundness of a home as a safe and sanitary dwelling. Not to be confused with an appraisal, which determines the value of a home. Jumbo Loan Mortgages that exceed the conforming loan limit. Lender Overlay Additional guidelines, imposed by a lender, that exceed those issued by a government-sponsored agency (Fannie Mae, Freddie Mac) or government agency (FHA, VA, USDA). Lender-Paid Mortgage Insurance The lender pays a borrower's mortgage insurance premium upfront, when the loan closes, in exchange for a higher interest rate. Letter of Explanation (LOX) A written explanation, from a borrower, that clarifies the circumstances surrounding an event or situation that could impact a mortgage approval. Commonly used to explain gaps in employment or late payments on debts. Lien The legal rights to a property until a debt or obligation is fulfilled. For example, a mortgage is a lien on a home. The lender has a right to the property until the mortgage is paid off. Listing Agent A licensed real estate agent who lists a property for sale on the market and represents the homeowner (seller) in negotiations with buyers. Listing agents represent the interests of the seller in real estate transactions. Listing Broker A listing broker holds the contract to sell a homeowner's property. When a property listing is procured between homeowner (seller) and either licensed real estate agent or licensed broker, the listing is always held in the broker's name. Loan Commitment The most formal and complete stage of qualifying a borrower for a mortgage approval. Commitments are made only after a full underwriting review of a borrower’s credit and capacity to get a loan. The property is also evaluated to make sure it meets the requirements of the particular loan program for which the borrower applied. Loan Commitment Letter A document created by lender, after full underwriting review of the loan application, issued to a borrower. It establishes that the borrower is ready and able to buy from the seller. Loan Estimate (LE) The document that shows a borrower all costs of completing a mortgage transaction, including items like the estimated interest rate, monthly mortgage payment and closing costs. As of October 3, 2015, the Loan Estimates replaced the Good Faith Estimate for most mortgage programs. Loan Processor An employee of a lender who typically gathers and manages the borrower's loan documents and assembles a loan file. Loan to Value (LTV) A ratio that compares the value of a home to the mortgage taken out against it. A loan of $320,000 taken out on a home worth (appraised or sold, whichever is less) $400,000 is equal to 80% of the home’s value. Or an LTV of 80. Margin The portion of an adjustable rate mortgage (ARM) that is added to the underlying index. It is essentially the lender's profit. The composition of the index and margin make up an ARMs total interest rate. While the index can change, the margin typically remains the same. Mortgage Broker An independent person or company who works on behalf of their clients to get a mortgage. A matchmaker between a home buyer and a lender. Mortgage Insurance A policy that protects lenders against losses should a borrower default on their loan. It is generally required when a borrower puts down less than 20% on a home purchase. Mortgage insurance is also required for refinancing when it it results in a loan-to-value (LTV) greater than 80. Mortgage Note A legal document that obligates a borrower to repay a loan, at a stated interest rate, for a specified period of time. Mortgage Rate Lock To set a guaranteed mortgage interest rate during the underwriting stage of the mortgage loan process, for a specified period of time. Mortgage Term The length of time the borrower will make mortgage payments until the loan is paid in full, typically 15 or 30 years. Negative Amortization When underpaid loan interest is added to the principal balance of a loan. No Closing Cost Refinance A home loan transaction where the lender pays the borrower's closing costs in exchange for a higher interest rate. Origination Fee The lender or broker's fee to evaluate a borrower's credit, capacity and collateral in order to recommend a mortgage program and carry out (make) a loan to a consumer. Payment Shock A large and/or sudden increase in a borrower's monthly expenses. This can happen when an ARM adjusts or when a renter becomes a homeowner, now with a mortgage payment that is greater than previous rent payment. Piggyback Mortgage When two loans are taken out simultaneously. Typically, the first mortgage is 80% of the home's value (sales price or assessed value) and the second is for 20%. Piggyback loans may be used to get rid of a mortgage insurance requirement. PITI The four major components of a monthly mortgage payment: principal, interest, taxes and insurance. Points A fee, paid to a lender at the time of closing. Each point represents 1% of the total loan amount. Pre-Approval An in-depth evaluation of a borrower’s capacity to qualify for a mortgage. Credit score, employment, income and available funds for a down payment are verified. Pre-Qualification A preliminary assessment at a borrower’s capacity to qualify for a mortgage. Credit score, employment, income and available funds for a down payment are not verified. Prepaid Items Payments made in advance of the loan closing, and put into an escrow account, before they are due. Prepaid items include things like like interest, taxes and insurance. These reserves help borrowers transition during the first few months after a loan closing. Prepayment Penalty A provision in some mortgage contracts where the borrower must pay a fee to the lender if they pay off their mortgage early. Proof of Funds A statement that verifies a home buyer's financial ability to buy a home. Typically, a pre-approval letter issued by a lender on behalf of borrowers or notarized statements from a bank or money manager (e.g. an account) on behalf of cash buyers will suffice. Refinance To replace an old mortgage with a new one on the same property. Used to lower the interest rate, shorten the term or to cash-out some of the home's equity. Reverse Mortgage A type of home loan the draws equity from an existing home and pays out the proceeds to the homeowner. Borrowers must be 62 years-old or older. Right of Rescission The legal provision giving borrowers the legal right, under the Truth in Lending Act (TILA) to cancel a mortgage transaction. Seasoned funds Money held in a bank account for 60 day or more. Second Mortgage An additional mortgage secured by a home. The result is a first mortgage (first lien) and second mortgage (second lien). HELOCs and equity lines are types of second mortgages. Seller's Market Periods when real estate markets favor sellers. Prices are driven higher and/or homes sell faster because demand exceeds supply. Short Sale The net proceeds from the sale of a home that falls short of the amount owed on the property. The lender must approve the transaction, knowing they will take a loss. It is an alternative to a foreclosure. Stratified Market Periods when a real estate market exhibits both buyer's market and seller's market conditions at the same time, but in different price ranges. For example, luxury homes could be in a buyer's market while starter homes could be in a seller's market. Streamline Refinance Mortgage refinance programs (VA, FHA, USDA, etc.) that require less documentation (and possibly no appraisal) in order to speed of the process. Title Defines the legal ownership of property and the manner in which be used via a bundle of rights (possession, control, exclusion, enjoyment, and disposition). Some rights may be distributed to more than one party, as would be the case when leased. Title Insurance A policy the protects homeowners and lenders from financial loss in the case of prior liens or encumbrances on the property. Underwater Mortgage When the outstanding loan balance of a mortgage exceeds the value of the property. Also known as "upside down." Underwriter The person (or automated software) that evaluates both the borrower and property involved in real estate transaction. Based on their findings, they approve, deny or suspend a home loan. USDA Loan A mortgage issued by a lender that is insured by the United Stated Department of Agriculture (USDA). VA Loan A mortgage issued by a lender that is guaranteed, or backed, by the United States Department of Veterans Affairs.